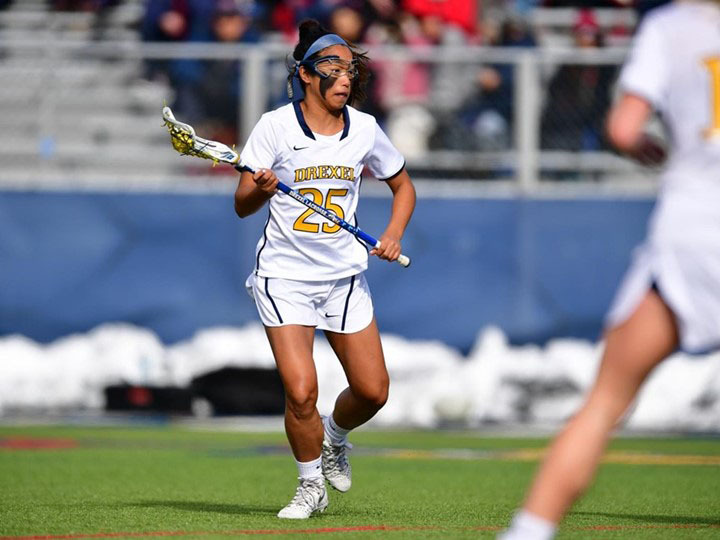 The Drexel University women’s lacrosse team has had a difficult start to their 2018 spring season. After dropping their opening game Feb. 14 to Johns Hopkins University 14-10, they came back to win their home opener Feb. 18 against Iona College 14-9. Since then, however, they have lost five games in a row. The team traveled to Villanova, Pennsylvania, March 10 to play the Villanova University Wildcats but lost 20-12. The Dragons were only trailing by two goals at the end of the first half, but the Wildcats came out on top after holding the Dragons scoreless for almost 12 minutes in the middle of the second half. The Wildcats took almost double the shots than the Dragons. However, freshman goalkeeper Zoe Bennett had 11 saves for Drexel against some tough shooters. Freshman Karson Harris was the star of the game as she scored four goals. Sophomore Lucy Schneidereith grabbed a hat trick, and freshman Colleen Grady had two goals and five assists. Another tough matchup against the Pennsylvania State University Nittany Lions March 14 sent the Dragons home with a loss 22-9. The first goal was scored by sophomore Caroline Cummings, but Penn State responded with three goals within the next two minutes. With 24:11 in the first half, Schneidereith converted on a free position shot for her 14th goal of the season, but again, another three goals from Penn State put the Dragons down by five with 20 minutes until halftime. Freshman Danielle Senour made her career debut with her first goal of the season with 9:37 left, but this would be their last goal of the first half as Penn State would hold them scoreless ending up 14-5. The Dragons were able to make four more goals by the end of the second half, but it wasn’t enough to come back against Penn State. Drexel had 14 turnovers compared to Penn State’s seven. Bennett had 11 saves, and Harris scored four goals again. Grady was right behind her with two goals and one assist. The Dragons now look ahead to host the Monmouth University Hawks March 18 at Vidas Field at 1 p.m. Last season, the Dragons defeated Monmouth 11-9, and hopefully this year they can do so again.